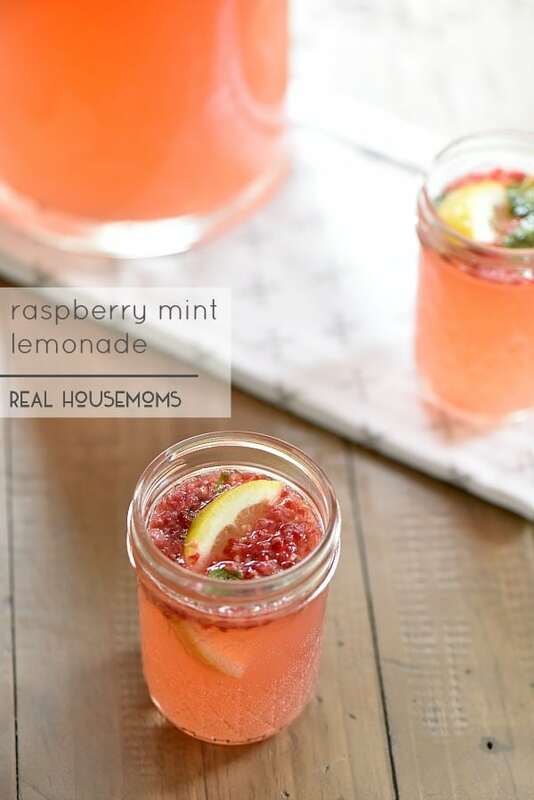 RASPBERRY MINT MOSCATO LEMONADE is a refreshing cocktail that tastes out of this world good. 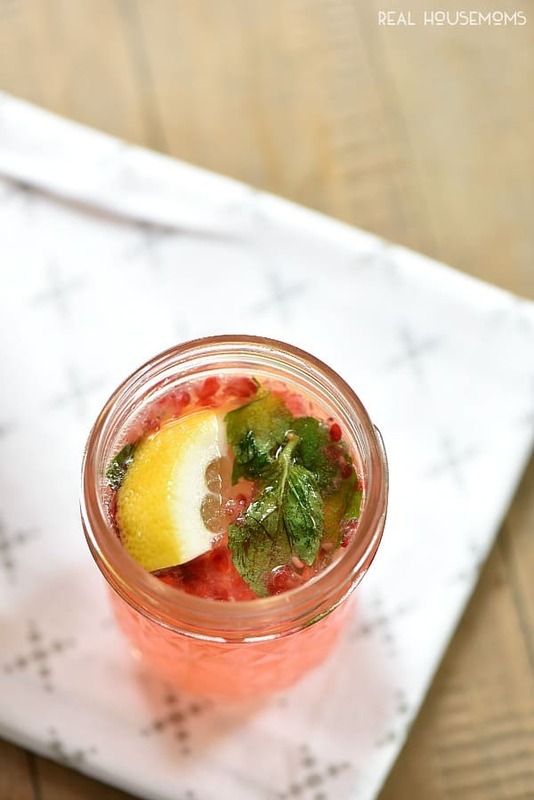 The fresh mint really makes it a refreshing treat to sip this summer. This past Easter it was just my little family and I. We love seeing family and friends at the holidays but it is nice to spend a holiday with just us and relax. It was a nice day and we had a great dinner relaxing at the table with our little guys and had a nice talk. My kids are at an age that they are really fun to have a conversation with. We had a great time! 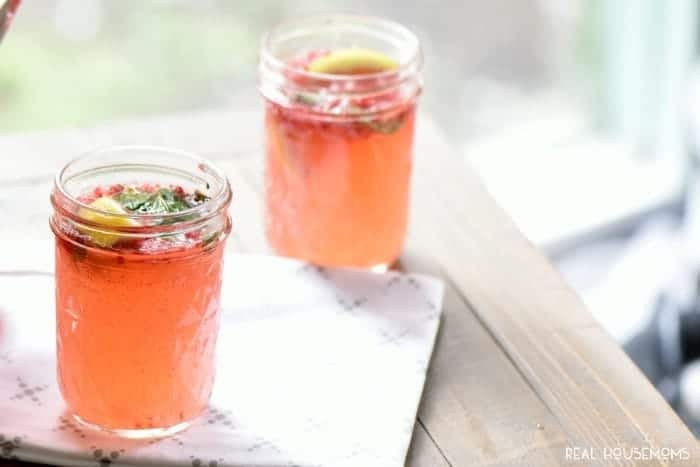 During the day my husband and I wanted to relax with a sweet and refreshing spring drink, so I decided to make up a fruity and minty lemonade, so we settled on Raspberry Mint Moscato Lemonade. Adding fresh mint to the drink makes it really taste so fresh! It one of my favorite things to add to a cocktail. While I was mixing up a pitcher I heard a STRONG knock at my door. I went to answer it and saw a friend running from the door to his wife waiting in the get away car. I opened the door and found a plate of lemony treats waiting for me! They had made lemon cupcakes filled with raspberry jam and I had a bite of heaven!!! Well we had to return the favor so I grabbed some mason jars and we made a dash for their house! We left the jars on the front porch and pulled a ding dong ditch! It was great! I love pitcher drinks and drinks in mason jars, don’t you? stir in the moscato wine, lemonade mixture, vodka and 7 Up.